The Machias Valley Farmers’ Market is located on Route 1 across from Helen’s Restaurant. The market runs mid May-October, Fridays and Saturdays, 9:00am-1:00pm. Member producers of the Machias Valley Farmers’ Market bring annual bedding plants and hanging baskets, field grown perennial herb and flower plants, vegetable and herb seedlings, baked goods, wild blueberries, jams, mixed produce, maple syrup and woven fiber arts to the market. The view across the water from the farmers’ market is quite likely one of the best farmers’ market views in the state. There’s a public boat landing and parking area across the street. The Sunrise Trail for hiking and bicycling runs right behind the farmers’ market. Jasper Beach isn’t too far away either! Outdoor activities near the market: The Bad Little Falls Park, about a mile from the market, is situated on either side of the Machias River, with a footbridge & large deck over the falls. With parking on O’ Brien Avenue, a gazebo and picnic tables, the park is an excellent spot for a picnic. Watch gulls, cormorants, & eagles fishing amid the roar of the waterfalls. 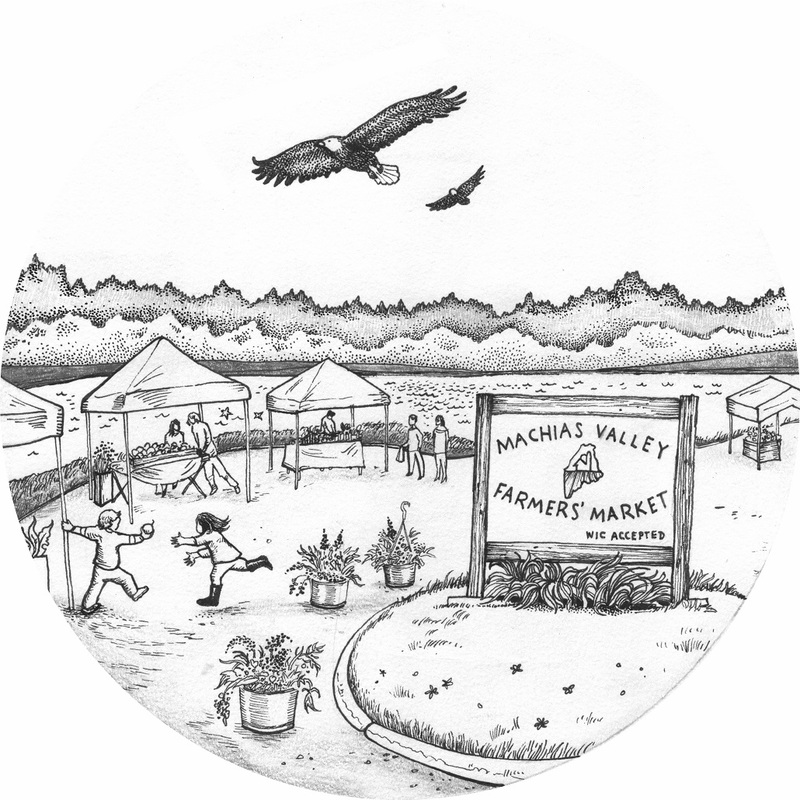 Indoor activity: Machias Valley Farmers’ Market coloring page here.